Another reason I love fall is that it is the season of cruciferous vegetables like broccoli, turnips, rutabaga, romanesco, and cauliflower. I found a lovely head of light orange cauliflower at the farmers' market this past weekend that I couldn't resist. I love to use it in soups and simply roasted in olive oil, but this head was just calling out to be gratin-ized. I love cauliflower gratin, but it's something we don't have very often as it soft of negates the nutritional value of the vegetable you are covering in cheese sauce, but that's okay to do every now and again, right? Plus it's so darn tasty! 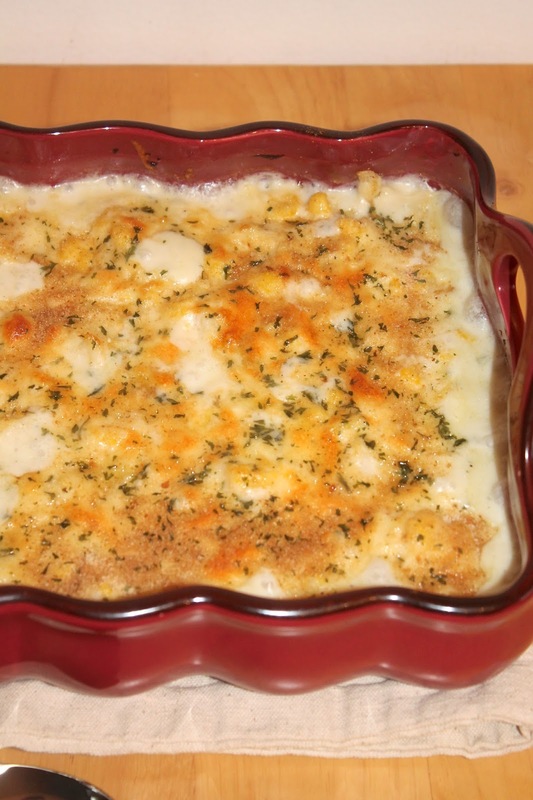 This is a super fall and winter side dish. It's sure to get even the most pickiest of eaters to accidentally eat a little vegetable! We enjoyed this gratin along with a ham steak and some homemade applesauce. 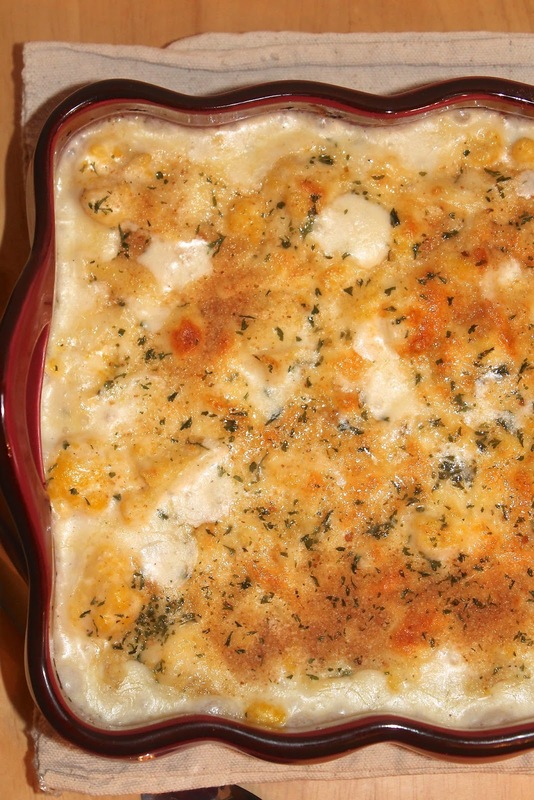 The cauliflower gratin will feel about 4 people as a side. Pancakes are kind of a thing on this blog... Mainly because I love them. 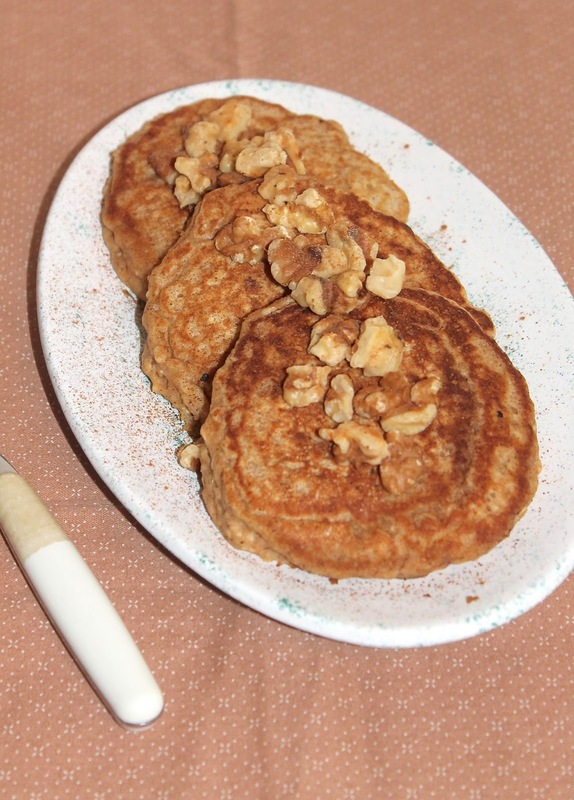 I've posted my recipe for pumpkin pancakes in the past - like, way in the past, before I had a decent camera and stuff like that... They are delicious, but this time I was looking for something a little more hearty and decided that pumpkin pancakes + oatmeal were the ticket to a delicious autumn breakfast. I know people get a little pumpkin crazy this time of year, but that's okay with me. I adore pumpkin, spices, and winter squash of all kinds. This recipe makes about 7 pancakes so it's the perfect amount for two hungry adults. My husband and I ate them all up on our day off when we were having a leisurely morning. These pancakes, plus some nice sage-filled breakfast sausages, plus a hot cup of coffee on a cool fall morning = happiness. Who else is ready for pumpkin season?? 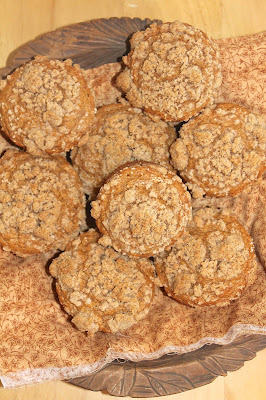 Have you already been making pumpkin foods or are you waiting a bit longer? I'm trying to use up the last bit of last year's pumpkin puree we froze from all the Long Island Cheese pumpkins were grew before it's time to restock from this year's pumpkins. At least that's my excuse for these tasty pumpkin muffins. We had our first preview of fall weather this past weekend and I loved every second of it. This week will be getting warm again, but not as hot as it's been. I was so excited to get to bring out sweat pants, socks, and a blanket. Oh, and a hard apple cider. It's the little things in life, right?! The leaves are just stating to get hints of colors in them and that makes me happy. These pumpkin muffins are perfect for a fall time snack or breakfast with a warm mug of coffee or tea. 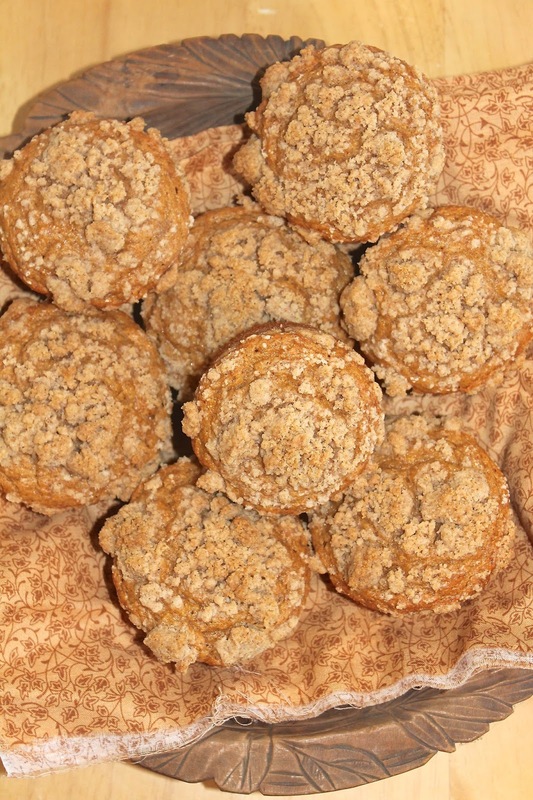 This recipe will make one dozen muffins - perfect for sharing. This is my kicked-up twist on classic stuffed peppers taking stuffed peppers to a whole new level of yumminess. 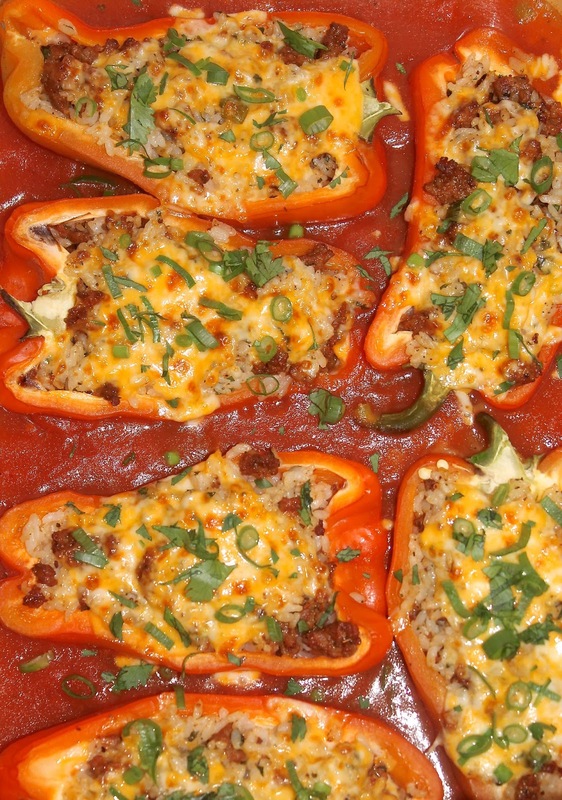 A homemade spiced tomato sauce makes the base of the dish and sweet peppers stuffed with chorizo sausage, rice, scallions, and cilantro are nestled in the sauce and topped with cheese. Yum! These peppers are a meal to make now as we are still getting tomatoes and peppers from our gardens, but are starting to get into fall and seeking some more comfort food. It's one of those late summer/early autumn transition dishes. I, for one, am really looking forward to fall - my most favorite season. I love this time of year when you are in the midst of peak harvest season and surrounded by fresh produce. It's time for me to get canning! We really enjoyed these peppers a lot. If you want a spicier version, try using poblano peppers instead of sweet peppers - this was my original intention when I was thinking of this dish; however, they didn't have any at the market that day but did have these really lovely red peppers. This dish will feed 3-4 people. 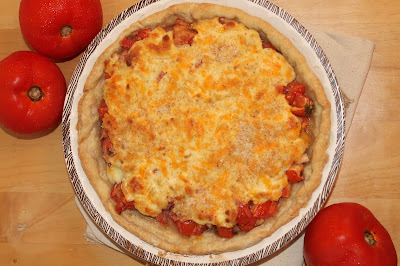 Southern tomato pie is a dish that I've had on my "to make list" for a while now. Since it's peak tomato season and since I'm doing my 2015 Pies in 2015 Challenge, I was able to get this one crossed off my list. I've always been a little hesitant of this dish because the top is slathered in a mixture of mayo and cheddar and some recipes I've read over the years contain just insane amounts of mayonnaise (in my mind anyways). So I played around with the topping a bit and used less mayo and added a touch of sour cream along with two cheeses. The topping is important because it makes the pie rich and delicious, and this version turned out great. Make this pie in late summer when you have the freshest and ripest tomatoes from your garden or the farmers' market or just from a nice neighbor. 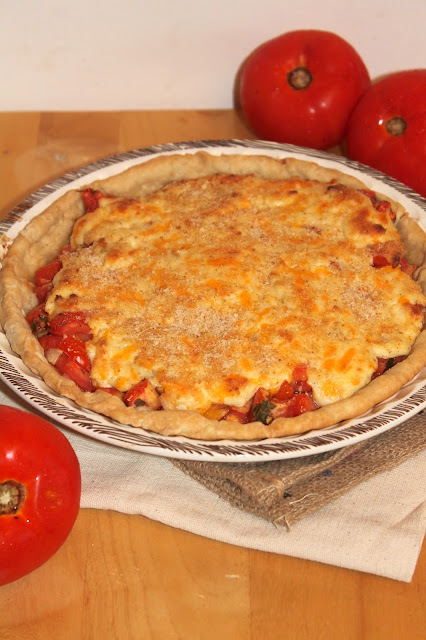 This savory pie really highlights the flavor of fresh summer tomatoes and provides a main dish way to enjoy them. This pie will serve about four people. Serve it with some pickles and a side salad, if desired.